Today after my Crossboot workout everyone was talking about going to do some YOGA. I have never done any Yoga before but always heard good things about it. The instructor was really knowledgeable and set everything up for us. This was a Hot Yoga class meaning the room is really hot so that you sweat more. I will definitely be going back to this Yoga class. Yoga is not hard at all and you do not have to be in shape to do it all. Anyone can do Yoga. Find a Yoga class whether its at your local gym or community center. Most gyms provide Yoga classes within the the monthly membership. You can even buy some Yoga dvd’s or search on Youtube for Yoga workouts to get some practice in. If you have any health conditions or pregnancy please consult with a doctor of physician before getting started with YOGA. Good luck and read some benefits of doing Yoga below: Thank you as always -LJAY HEALTH! Thank you! Was hard work was actually suprised at myself! Just wanted to say this was an awesome post, it is a great advert and explanation of all the benefits of Yoga. Now you make me want to give it a try haha. Glad to see someone new enjoying yoga and loved the detail with the benefits you listed! Thank you! I’m glad you liked. I try to do different types of workouts and exercises. Makes for a better athlete! The more one exercises yoga, the more one see its effect on body and psyche. It relaxes quickly and alter mind as if it was meditating (probably due regular deep breaths combined with movements). I’ve been practicing yoga for 14 months now. I even take my four-year-old for family yoga classes! 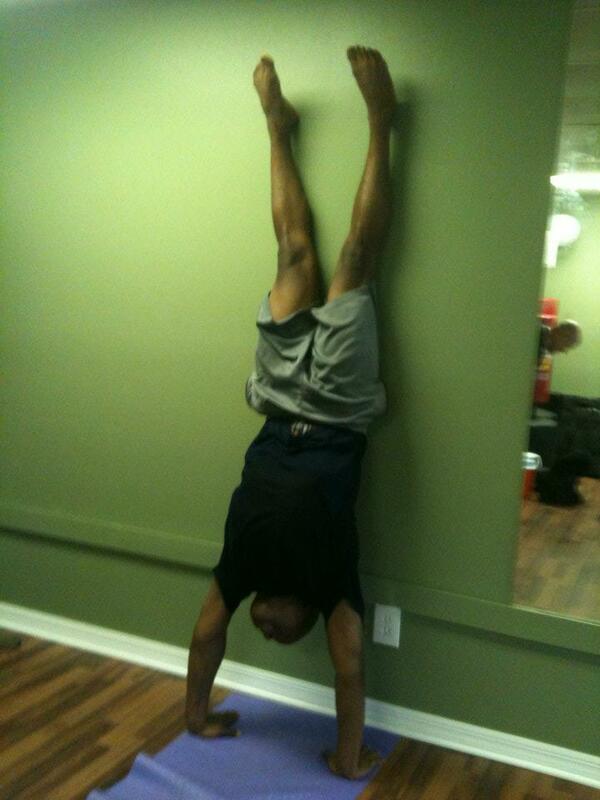 Did you really do a headstand in your first yoga class? That’s nothing short of awesome! Great review of the benefits of yoga. Even though “anyone” can do yoga, the benefits of a long term practice are amazing. Glad you gave it a try! Yes! I am practicing it 3 days a week now. Yoga rules. I love it! It sure does! What a great feeling afterwards!! Thanks for visiting my site! I will follow you for some exercise tips. I love yoga – use it as part of my cross-training and to de-stress. I recommend it to people I counsel for weight loss because of the mindfulness it provides. That is a piece of the healthy eating puzzle that so many people miss. You should. Great for flexibility, core building and muscle toning! Yoga benefits the mind, body, and soul. Thank you for following my blog. I love this~probably not a shocker! 😉 Thank you for such a straightforward, encouraging post on the benefits of yoga! Another great post of yours and let me say your “wheel pose” is lovely. You are very open and flexible in your upper torso. Most men who weight train lose alot of their natural flexibilty as they get older and / or train harder. Are you a personal trainer as well? Thank you Cheryl, I try and do yoga at least twice a week. Many people are surprised when I perform yoga moves because of my body build haha. I do personal training as well! I thought you did, at least I hoped so. Your the kind of trainer I love to see. Very motivational but teaching safe, tried and true methods. Eat right, move right and it’s all right. Words to live by ( I also throw in “breath right “). A most extensive list of the health benefits of yoga. Lovely. I really appreciate this truth being highlighted: anyone can do yoga. I know it’s true as I have been a teacher for over 11 years and have worked with people who cannot stand unassisted. And what a great list you’ve compiled of yoga’s many benefits. Thanks for sharing! Sorry for leaving comments all over your blog , all your posts are so readable and I can relate to them. 🙂 you should try bikram yoga! It’s really great and can burn more than calories than a 10km run..
Wow. I will def have to try it out. Live burning calories! Thanks for the advice! You can do it too. It just take practice. Practice on stretching your back muscles more and do some glute bridges (check youtube for this movement).